Have I Described It Correctly? I'm practicing IELTS writing and I need to describe the picture I attached. Is the following good? or how can I correct it to be more well-written one? 50% of the compound is sand, a quarter crushed rock, 15% cement and 10% water. Oh now I see that I forgot to button the "Add to post". The picture is not that significant since the figures are all written. I do want to know whether the sub-verb deletion sounds ok. 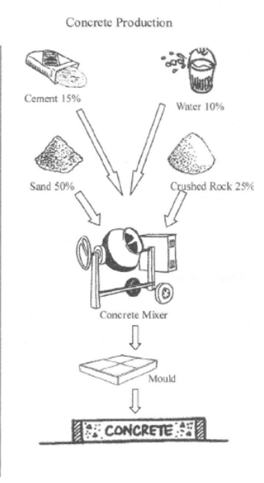 Concrete is 50% sand, a quarter crushed rock, 15% cement and 10% water. Do I Link Sentence A, B, And C Correctly?